Back from a 2-day hiatus due to injury from strenuous work, we landed on IFLO. Sounds like a good name to me. The last two days have been calculated into the final performance numbers at the bottom. This is getting to be a tight race. The market paused to catch its breath following Friday's gains, and finished with one of its more uneventful days of the year. There was little intraday rotation as buying the leaders at any given time resulted in similar returns to buying the laggards. Some of these tech names are really extended. 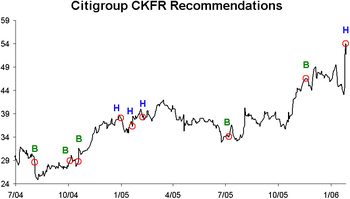 CheckFree (CKFR) was downgraded at Citigroup this morning by the top performing analyst on the stock based on BARR ratings. See the chart below for the analyst's historical calls on the stock. 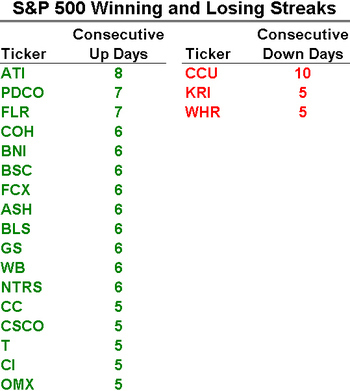 The week closed on a strong note today, and unlike the last few days, traders chased strength as the leaders outperformed the laggards for the better part of the day. Unreal Mad Money Trading After Hours! Jim Cramer usually says the purpose of his Mad Money show is not only to make his viewers money, but also to educate them. Apparently some of the viewers though, have no interest in learning. At the start of Mad Money tonight, Jim Cramer came on and enthusiastically said NMT Medical could go from its current price of $17.26 to $100 in a short period of time. We quickly went over to our Bloomberg and pulled up a quote for NMTI, and the stock was already trading up to $22 a share for a gain of 34%. But Cramer's recommendation of NMT Medical moved another stock even more. At the same time, we pulled up a quote of NMT (Nuveen Massachusetts Premium Income Municipal Fund), a closed-end fund that trades an average of 3,500 shares a day. We watched in astonishment as traders mistakenly began bidding NMT up in response to Cramer's $100 recommendation of NMT Medical. Within 30 seconds, the closed-end municipal income fund ran from $15.50 to $22 on tens of thousands of shares for a gain of 46%! A Closed End Muni Bond Fund! It stayed up for at least 3 or 4 minutes until everyone became aware that NMT was not the stock Cramer was talking about. Talk about doing your homework before buying a stock. Due to the late hour, we were unable to obtain a locate to short the stock, but others were able to, and they sent the stock back down quickly. Currently, NMTI is trading around $23 and NMT is all the way back down to $15.50 on over 100,000 shares of volume. Unbelievable! Here are a few quick blurbs from our February 2006 issue of Reminiscences by Laszlo Birinyi. The most dangerous words in this business: it's different this time. Wall Street thrives on clichés and adages of which the above is one of the most pervasive. We have been loathe to make a prediction or forecast for 2006, in part, because the market today is different, and while we look for parallels or historical precedents, we also recognize that the market is dynamic and always different. 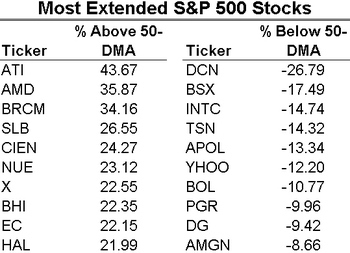 ...One of today's contentions is that large-cap stocks will outperform smaller and mid-cap names in part because they have not done so for some time. Our view is that the changing market trumps and negates that conclusion. Please visit www.birinyi.com for more information on subscribing to our monthly newsletter. With Q4 GDP coming in well weaker than expected (1.1% vs 2.8%), pre-market futures are off their highs of earlier in the day. Be aware however, that with all of the comparisons between the current market environment and the 1994-1995 period, as well as the bullish sentiment in the market place, we will be sure to hear how in 1995 the same thing happened (see chart below), "GDP hit a soft patch for one quarter prompting the Fed to stop hiking rates, and putting the economy back on track". The next move came today, and it was higher, as the market had a strong rally. 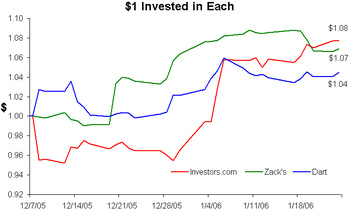 Once the lows were put in, investors looked to buy on weakness as buying the laggards at any given time significantly outperformed buying the leaders. 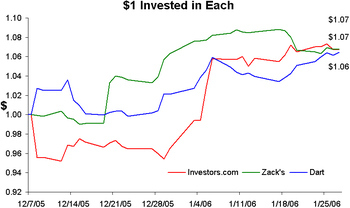 Investors.com has taken the lead over Zacks.com for now. See chart below.